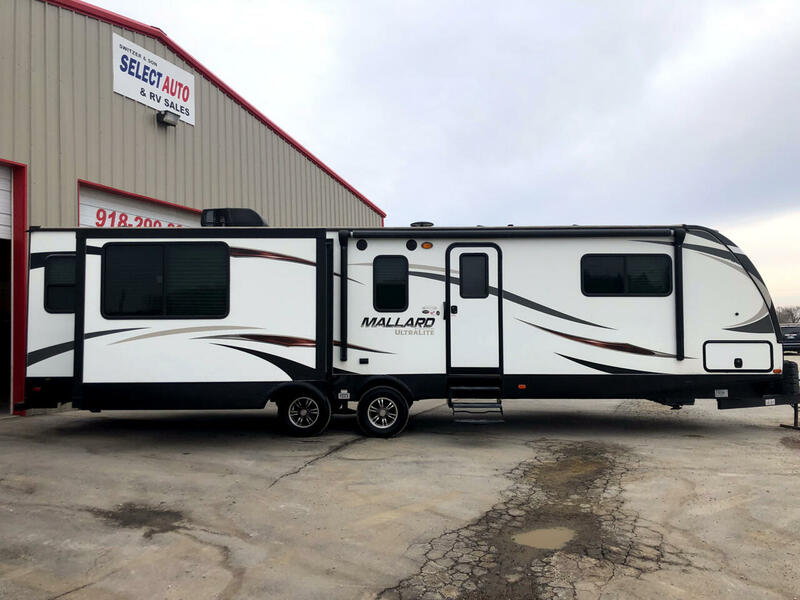 Here is a 2017 Heartland Mallard M325 Triple Slide out Travel Trailer. This unit is like new in every way. Everything works as it should. This unit has not been smoke in or lived in. This is a rear living room arrangement. It has 2 Super Slides in the living room and a bed slide out in the bedroom. This gives you the large closet across the front of the unit. Here is a list of some of the options on this unit. Leather interior, Ducted Heat, Ducted Air Conditioning, Power Front & Rear Jacks, Dual Propane Tanks, Power Awning, Large double door refrigerator, 3-Burner Cook top with oven, Microwave, Central vac system, Glass shower enclosure, private bathroom and so much more. SELECT AUTO SALES WOULD LIKE TO INVITE YOU TO COME OUR NEW INDOOR SHOWROOM. WE ARE LOCATED 3 MILES WEST OF 75 HIGHWAY AT THE WEST 51ST STREET EXIT OFF OF INTERSTATE 44. WE OFFER BANK FINANCING WITH RATES AS LOW AS 2.99% FOR UP TO 84 MONTHS IN TERM AVAILABLE W.A.C. TRADE-IN'S ARE WELCOME. WE ARE HERE MONDAY 9:00 AM TO 5:00 PM, TUESDAY THROUGH FRIDAY FROM 9:00 AM TO 6:00 PM AFTER 6:00 PM BY APPOINTMENT. SATURDAY BY APPOINTMENT ONLY. BE SURE TO CALL TODAY TO SCHEDULE YOUR TEST DRIVE. FEEL FREE TO VISIT OUR WEB SITE WWW.SELECTAUTOSALESOK.COM FOR MORE INFORMATION. OUR OFFICE NUMBER IS FORWARDED TO OUR CELL PHONE AT ALL TIMES. FEEL FREE TO CONTACT US AT ANY TIME FOR MORE INFORMATION.